Each Halloween for the past few years, my sons, ages 11 and 14, alternate between a main (hard to make) and secondary (easier to make) costume. 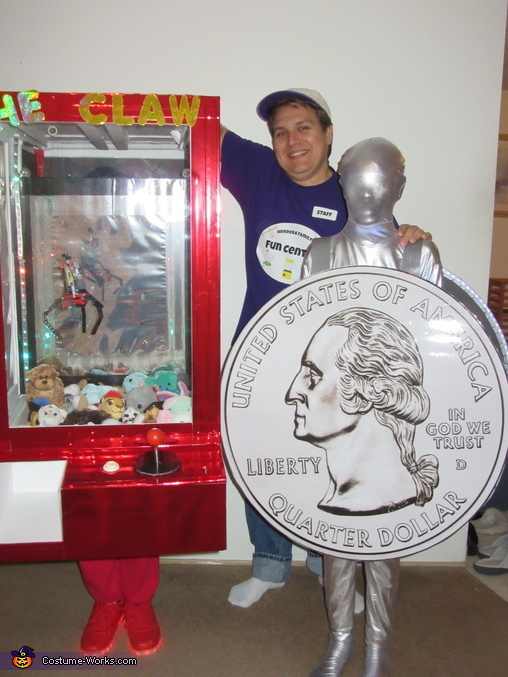 This year it was my youngest son's turn for the complicated costume, so he randomly came up with the idea to be a "claw machine," like those found at arcades and fun centers to win stuffed animal toys. The frame of the claw costume is made from PVC pipe and the shoulder rests and stomach brace on the inside are padded with recycled denim batting (which came from ice pack packaging) - wrapped in duct tape. The shell is made of foam/poster board, with the "windows" made of acrylic film. The back “mirror” is made from reflective (one-way) window film, for window tinting. The RGB LED lights are soldered in parallel (5 strips, with 20 LEDs per strip), to synchronize the light effect, and are controlled by an Arduino Uno. The program is a modified version of another Christmas light display program and is setup to allow my son to select the lighting ‘effect’ he wants, by pressing a button mounted inside the suit compartment. The claw, rigging and controls are made from Lego: various Technic pieces, 2 Lego Mindstroms EV3 programmable bricks, 2 sensors (one to detect when a quarter is inserted), 3 motors and a Lego pneumatic pump system (to open and close the claw). The actual joystick and ‘grab’ button are from a real arcade game, for authenticity, but the Lego parts are what make them actually work. The outer box is primarily red duct tape and red Christmas wrapping, however the front panel is wrapped with a red chrome vinyl. The top is also covered with a clear shelving liner, so that it would stand up to rain better – we are in the northwest. To top it off, we added stuffed animals, and my son wore red sweat pants and solid red LED light up shoes. My older son’s costume is an Oregon quarter (to be used in the claw machine, of course!). The images (front and back of a quarter) are from the US Mint website and were blown up to a 30” diameter. The sheets were then pasted to foam/poster board with spray adhesive and covered with clear shelving liner to protect from rain, but to also give the coin a glossy finish. I then added an inner ¼” foam board lip, ¼” inside the coin’s circumference, and added bright white LEDs on the front and back. A battery pack was hidden behind the front coin board and the LED strip lighting for the front and back were soldered together. The straps are made from standard gray duct tape. My son wore a silver body suit. Both my wife and I wore custom "Staff - Herrera Family Fun Center" shirts and matching hats to finish off the theme. We created the logo with clip art from the internet and then used iron on transfers. When people saw the claw machine and quarter, their initial response was "cool," "amazing," "wow!!" or something similar. Everyone absolutely loved it and couldn't believe the amount of detail and work we put into everything. 1. Does the claw machine work?! 3. How heavy is that thing?! We didn't keep track of the cost of making the costumes. I know it was well over $100 though, not including the Lego parts, Arduino, LED lights and battery packs. We spent way too much, but the reactions we got from our kids and everyone that saw us was worth it!